After 10 years, developers of Camino, a Mac-only browser built atop Mozilla's Gecko engine, called it quits yesterday. "Camino is no longer being developed, and we encourage all users to upgrade to a more modern browser," stated a message on the open-source browser's website. "Camino is increasingly lagging behind the fast pace of changes on the Web, and more importantly it is not receiving security updates, making it increasingly unsafe to use." Camino debuted in March 2003, but goes back a year earlier, when its forerunner, Chimera, was released. The last update, Camino 2.1.2, was issued in March 2012. Camino's developers pointed Mac users toward other choices, including Google's Chrome, Mozilla's Firefox and Apple's Safari. But Camino served a special function: It was one of the few browsers that ran on older editions of OS X, and worked on Macs equipped with PowerPC processors, precursors to the Intel CPUs now in all current Macs. Mozilla, for example, retired Firefox for OS X 10.4, aka Tiger, in 2010, and the last version of Firefox that ran on a PowerPC Mac was 3.6.28, which shipped in March 2012. Firefox 21 is the current version of Mozilla's browser. Nor do the newest versions of Chrome or Safari support PowerPC Macs, or OS X 10.5 (Leopard) and earlier. According to Internet measurement company Net Applications, nearly 8% of all Macs that went online in April relied on Leopard or an even older edition of OS X. One replacement for Camino is TenFourFox, another browser built with Mozilla's code, but which has been fine-tuned for PowerPC Macs running Tiger or Leopard. TenFourFox currently stands at version 17, and is functionally equivalent to Firefox 17, the browser Mozilla shipped last November. The demise of Camino makes Apple's Safari the second-oldest remaining browser; Safari debuted in January 2003, more than a year before Firefox 1.0 and five years before Chrome. Microsoft's Internet Explorer, introduced in 1995, is the world's oldest browser, with just two years to go before celebrating its twentieth birthday. Development on Camino, a Mac-only browser built atop Mozilla's Gecko engine, has ceased. 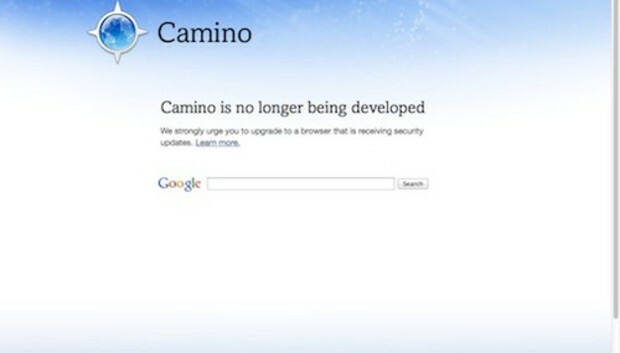 This article, It's the end of the road for the Camino browser for Macs, was originally published at Computerworld.com.